Dark Ages 2.0+©: Is the Party is Over for the Human Race? Winding down civilization? Is the Party is Over for the Human Race? Winding down civilization? Narrated by Richard Heinberg - Wikipedia, (his Home Page) author. educator. speaker. 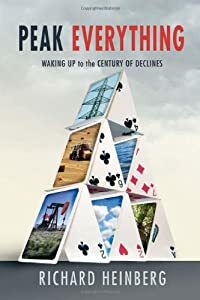 Author of: Peak Everything: Waking Up to the Century of Declines - $19.95 (PDF eBook); Amazon.com: Peak Everything: Waking Up to the Century of Declines (Hard and Paperback editions, various prices). This video demonstrates that, how in the space of three lifetimes, all aspects of our economy, including energy, transportation, agriculture, and manufacturing, have become completely dependent on fossil fuels, which are both finite in supply and dangerously polluting. In the space of three lifetimes, our society has come to teeter on the brink under the pressure of climate change, population growth and out of control consumption. Can we learn to "live within nature's budget of renewable resources?" Can we get past our political and socio-economic differences and work together? From Beijing to Bangladesh, from the Capitol in Washington, DC to the climate talks in Cancun, the picture is not encouraging. Can we redesign cities, healthcare, manufacturing, and, most important, our cultural values, before it is too late? The change can only start with us, right now.